My earliest and forever kindness role model would be my mother. I am blessed to have had her example. My father was also a man of kindness and gentleness. I don’t recall either of them treating anyone in a overtly nasty or unkind way. They had strong principles and beliefs, and definitely drew the line on others who might think and believe differently yet I never heard them express their disapproval in hurtful and ugly ways. It was mostly done in thoughtful ways. One memory of kindness that stands out was when I messed up at my piano recital and couldn’t remember the rest of the song. I must have been about nine or ten. When we returned home my father sat down with me and encouraged me to play the song all the way through so I’d know that I could do it. I felt supported by his kindness. Down through the years there were many who displayed kindness along the way. There was one time when I was walking home from Brownies when it was beginning to get dark outside. A dog ran up to me and blocked my way, growling and barking. I was paralyzed by fear. A teenage boy rode up to me on his bicycle and chased the dog away. I didn’t know who he was, and just rushed on home, relieved he was there to help. A kind act I still remember! My family ~ my siblings ~ my children ~ my grandchildren …….. so many acts of kindness I couldn’t even begin to list them. Many, many friends and acquaintances down through the years who offered a kind and supportive hand during good times and bad, offering words of inspiration just at the right time to give me hope. I’m going to risk treading into an area that’s a hot-button issue right now only because I strive to look for the goodness and kindness during times when these issues rise up. For the last ten years I’ve had neighbors across the way who have offered me kindness and support. They are a Muslim family who have reached out to me and I was privileged to get to know. I was invited to their home when each child was welcomed into the world. We would share customary foods with each other during our traditional holidays. When I had surgery the children would bring over offerings of food to cheer me up. I was truly blessed with knowing them and learning from them. Recently they’ve returned to Indonesia to live near relatives. They have dual-citizenship. They never said an unkind word about what was happening politically here in our country yet the father shared with me their fear of what was developing. I think of them often now and hope they are happy in their new home. 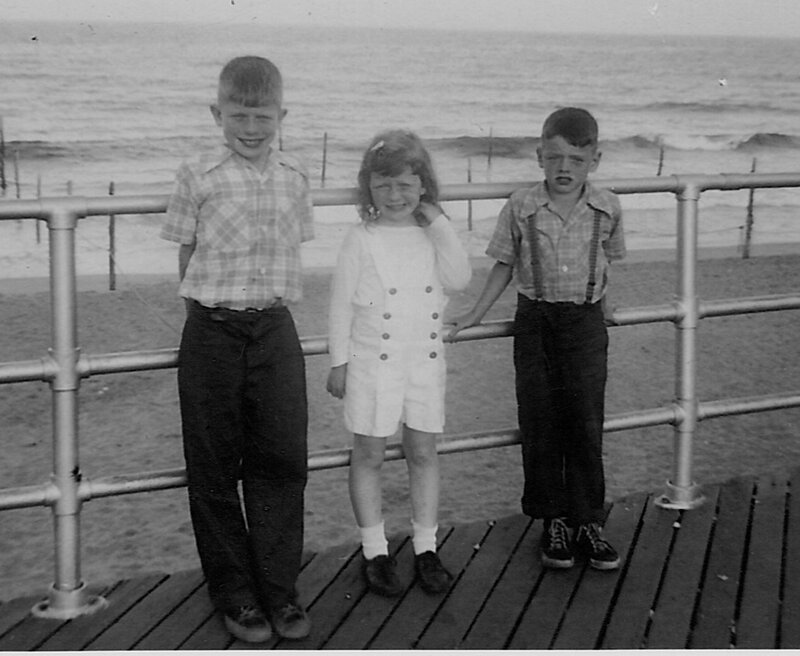 That’s Me in the Middle with my two brothers, J. and R. I’m the official middle child in my family of five siblings. This is the story of my journey in the middle of my awesome and challenging life and you can read more by going to my “About” page”. Three years later and I’m amazed at how much satisfaction I’ve gotten from blogging and how much my posts have expanded into wonderful experiences and meeting wonderful bloggers. My initial intention was to put my life story down in writing, the good and the bad, and from it to see all the life lessons along the way. I did that! I wrote and I wrote and I wrote until I had Eight Chapters. Looking over the first year really gave me confidence. One of the major influences in making the transition from Pages to Blog was the A to Z Challenge 2016. I used it as a way to bring together all the lessons learned through my life. It was a real purging and letting go of the past. So, what a difference a year makes! The fourth prompt for the Kindness Challenge 2017 is Kindness Role Model. “When I said ‘pray with me,’ he just closed his eyes and tried to keep breathing,” she recalled. The above link is the promotional video of the Game Farm in 1992 before it closed in 2006. This follow-up video shows a fly-over view after it closed. I love the background music ~ Forever Young ~ Click Here. While my children were growing up, a road trip to the Catskill Game Farm became a well anticipated fun day. I don’t recall if my siblings and I went there. At least I don’t have any pictures capturing the memory. Recent news is that there’s an effort to revive the Game Farm. New owners of former Catskill Game Farm have big plans for property (See video below) and following that,Click Here , for Catskill Game Farm Slaughter ~ The controversy over whether the Game Farm should exist or not and what became of the animals when the farm closed. For more on the history of the Catskill Game Farm click on here….. It had been over two years ago that we siblings had gotten together in a group. We were due another reunion before anymore years slipped by and we lost the chance for all four to be in the same place. My sister and I have a birthday tradition of treating each other to lunch and catching up on the family news. My older brother, R, started the ball rolling for a old family photo sharing reunion. He had been telling us for quite some time that he had some great family-photo stash and we kept urging him to share with his siblings. The rest of us were lamenting that we had so few photos of our childhood and some of the pics were in pretty bad shape. So the date was set for the four of us all to travel to our sibling reunion and find out exactly what photos my brother, R, had in his possession all these years. We all got busy searching through our old family photos of when we were growing up ….. scanning and editing, preparing for the big day that we would see the stash that my brother had held all these years. We weren’t disappointed! There were pictures of each of us that we’d never seen before all neatly arranged in a photo album. We’ll all be getting copies of these fantastic memories of our shared childhood experiences thanks to my youngest brother’s wife, L, who has been gathering family photos and ancestry information for all of us. After spending the day with my brothers and sister sharing all these old family photos and just being grateful for each other and life, I read this post on the following morning and it reminded me of us. It was a moment of Grace. We’re strong, good people who have tried to do what’s right and be there for each other. The post below reminds me of our Journey together. In my own roles as teacher, facilitator, coach, mother, wife, and friend, etc., I do my best tohold space for other people in the same way that Ann modeled it for me and my siblings. It’s not always easy, because I have a very human tendency to want to fix people, give them advice, or judge them for not being further along the path than they are, but I keep trying because I know that it’s important. At the same time, there are people in my life that I trust to hold space for me. 7. Create a container for complex emotions, fear, trauma, etc. When people feel that they are held in a deeper way than they are used to, they feel safe enough to allow complex emotions to surface that might normally remain hidden. Someone who is practiced atholding space knows that this can happen and will be prepared to hold it in a gentle, supportive, and nonjudgmental way. In The Circle Way, we talk about “holding the rim” for people. How do you feel about this article? . If he was with us I would be in the middle of the five of us.